We had some wonderful show & tell this week at Club meeting. I'd like to share some pictures with you. Karen was busy knitting a couple of beautiful scarves and a hat. I just love the pattern of the hat! Beautiful, Karen! My DIL Zlaty made these wonderful projects. I just love her log cabin wall hanging. It looks so warm and cozy! The lower quilt she made and is donating to Quilts for kids. For more info you can click here. Wonderful work Zlaty! Brenda shared her antique dresden plates with us. She replicated the patches and made two of them from fabric that she had. She did a great job! It is difficult to tell which are the old patches and which are the ones that she just made. The yellow sashing is perfect! Next she needs to add the borders and the top will be finished. It looks wonderful! This past weekend we went to Washington DC with friends. We had a great time! While we were there we visited the American History Museum at the Smithsonian. Of course the first thing that I wanted to see were the quilts that were on display. If you ask at the desk, they have a list of the quilts, their history and where they are located in the museum. They had 3 on display at this time. The first one I saw was Mary C. Pickering's Quilt. This quilt had appliqued floral baskets and vines with trapunto style quilting in elaborate fruit and floral designs. The second quilt was a Hawaiian quilt. This quilt was made as a wedding gift for Rosina Georgetta Kalanikauwe-kiulani Ayers, who is said to have been a descendant of King Kamehameha. The third was a reproduction of a cradle quilt. The original was made approx. 1836. Next I went to see the First Ladies Dress Exhibit. They had some fabulous dresses on display. I really loved the inaugural gown that Helen Taft wore. It was from 1909, made of white silk chiffon with appliqued floral embroidery in metallic thread and embellished with rhinestones and beads. It looks so elegant and graceful. Afterwards we visited Julia Child's kitchen. It was so cool to see where she prepared so many wonderful dishes! I have watched the movie Julie & Julia twice now. And each time I just want to go home and COOK! While at the museum I also saw this beautiful embroidered pocket. I know from a trip to Williamsburg that women wore these to keep their sewing things in and I'm sure whatever else they needed. I love the idea of having one of those today, since I do not always have a pocket and it would be a great way to keep what you need to work on a project so handy. We also attended a concert at the Kennedy Center and visited the Washington National Cathedral. They are both awesome places! I did not even see everything at both places and I was in awe of them. Hopefully we will get a chance to visit another time and see even more. I'd like to share some projects with you that some of my very talented customers made. Tricia made this lovely bag called the Catalina Sling by Pink Sand Beach Designs. She added some extra pockets inside and one on the back of the purse. It turned out wonderful! 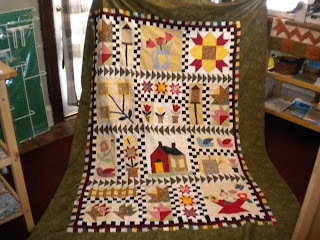 Stacey finished her Cottage Garden Sampler quilt top. It is beautiful! She did such a great job! 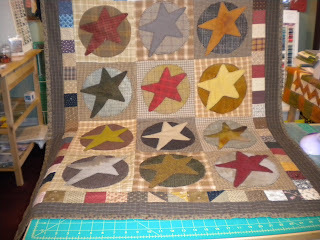 Carol stopped by and shared her star quilt with me. It is made with wool applique. Absolutely wonderful! My Mom & Stepfather made this quilt many years ago. Mom wanted to put it on her bed, since it had been a while since she had gotten it out of storage. It was put together using a quilt as you go method. Don't you just love the old fabrics! It's wonderful! 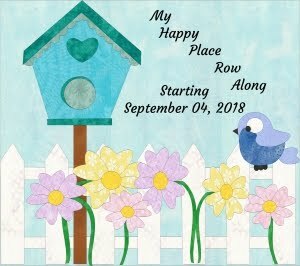 My name is Jean Boyd and I owned the Happy Sewing Room for almost 23 years. 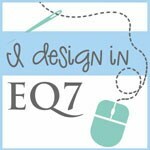 I have now retired and am designing patterns which are now on Craftsy.